"History begins where legends die." The unflinching power of Niagara Falls has inspired all types of artists and daring souls to attempt to reach greater heights. During one particularly exciting moment of Niagara—Miracles, Myths & Magic, a courageous tightrope walker slowly glides across his narrow wire above the deadly waters. Dressed in a flamboyant shirt and tights, he balances himself with only a flimsy pole and hardly wavers while crossing the falls. The funambulist makes this action look easy, but the danger still causes our pulse to quicken a little. This scene represents one of the rare highlights of the film, which loses its direction and misses much of Niagara's allure. The three-tier structure may makes the story easier to follow, but it also removes the raw passion from the immense landmark. Director Keith Merrill (Yellowstone) appears to follow a similar pattern with each of his IMAX films. They begin with a look at the native inhabitants, then move onward to the white settlers before quickly finishing at the true highlight—the actual landmark itself. Three of his movies have been packaged in the "America the Beautiful" DVD collection, which showcases some of the country's most notable sites. While none of the movies are particularly groundbreaking, this picture offers the least-interesting tale and does not involve the viewer for much of the short running time. A few innovative sequences do appear, but they exist within a mediocre final product. This tale spends a bit more time with the early settlers than its companions. We learn the "Maid of the Mist" legend, which is presented in a hokey manner that does not inspire wonder. Next, the French explorer La Salle arrives at what the Native Americans called "Thunder and Water." Battles ensue for control of this valuable area and continue for more than 100 years. Unfortunately, the information given remains vague and never goes beyond the surface material. The focus stays with sloppy recreations instead of providing some truly insightful moments. The most interesting scenes occur in the final segments, which showcase humans trying to conquer Niagara. While still presented in a slightly awkward manner, at least we receive some nice views of the falls. First-person shots of the steamship "Lelawala" traversing the rough waters are well done, and the previously mentioned tightrope walker is effective. We also observe middle-aged Annie Taylor climb into a barrel and ride it over the Niagara's edge. Although not particularly bright, she does survive and gain some minor notoriety. These moments are mildly exciting, but they still fall short of the grand possibilities of an IMAX release. Niagara—Miracles, Myths & Magic provides a few thrills, but it misses the emotional side of the stunning landmark. Image Transfer Review: This release appears in an effective full-frame transfer that manages to place the key elements of the giant IMAX picture onto the small screen. While we're probably missing the extra scenic elements on the edges of the frame, the overall scope still works decently. There are some minor specks that appear on the print, but they only provide a small distraction. The colors are obviously not comparable to an IMAX screen, but they still remain bright and remarkable. Audio Transfer Review: An impressive six language tracks are available in the 5.1-channel Dolby Digital format. This is a nice touch and was probably not too difficult given the limited narration and dialogue. The music and ambient noises emanate nicely from the speakers and help to create a well-defined soundfield. Much of the story's success depends on the audio creating a up-close atmosphere of visiting Niagara Falls. While the set pieces may not all work, this transfer does its part to create a believable environment. Extras Review: Niagara—Miracles, Myths & Magic offers a few more extras than its companions in the "America the Beautiful" set. First is a 19-minute promotional documentary that provides a little bit of background into the production and concepts. This piece suffers from too many lengthy clips from the actual film, which seems unnecessary here. There are some insightful interviews with director Keith Merrill, but they only cover a few minutes of the featurette. Another nice bonus is an isolated music and ambient sounds track that eliminates the narration and dialogue. I especially enjoyed this feature because it allows us to really grasp the beauty of Niagara Falls. This disc also contains five theatrical trailers, which appear in full-frame formats and cover a variety of notable landmarks. 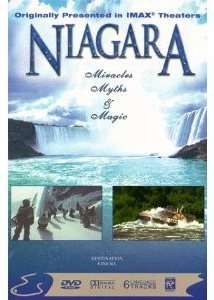 Niagara—Miracles, Myths & Magic does provide the legends, but it somehow misses the magical side of the falls. The concluding sequence presents a harrowing experience for a family sailing too close to the edge. Their survival is supposed to be an enchanting scene, but it seems mostly uninspiring. The overall product does not completely fail, but its safe and mediocre direction leaves too much unsaid.